The FloWare app Quick Symbol Edit was developed for such users who want to fasten the librarian work flow. 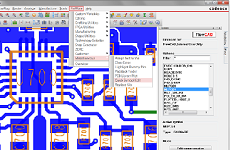 There are three typical use cases for this app in OrCAD PCB Editor or Allegro PCB Editor. At first there is a possibility to change a symbol in the same session, which is similar to the Modify Design Padstack handling. The second methodology is to open a new session with a pre loaded Symbol.dra file. And finally you have the choice to export the symbol as .dra, .psm, .pad etc. in a specified directory. The file opening and closing will be handled by the app automatically.